OAKLAND • The last time the Golden State Warriors lost four straight National Basketball Association games was in 2013, predating the Steve Kerr era. It was when they were not the force that they are now, as arguably the greatest team of this generation. 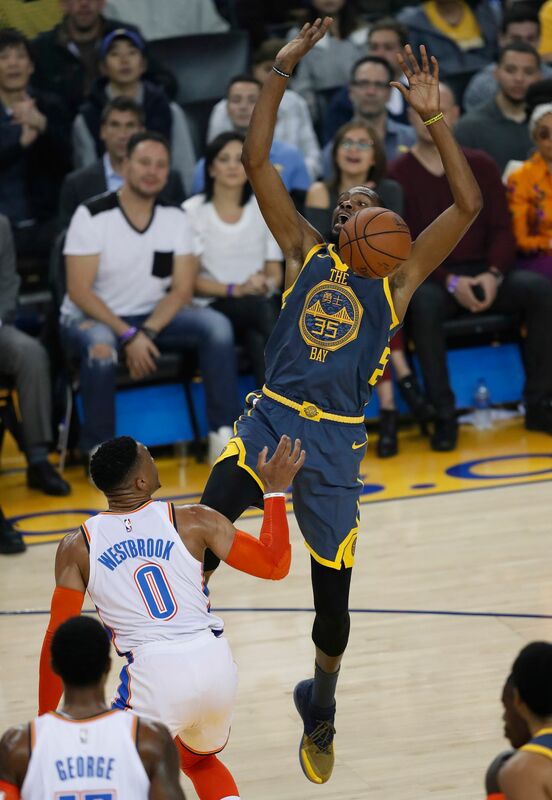 While it is too early in the season to say that the league champions are returning to those lean years, 450 games ago, alarm bells are ringing around the Oracle Arena after the Warriors fell to the Oklahoma City Thunder 123-95. Russell Westbrook recorded his 105th career triple-double, while teammate Dennis Schroder added a game-high 32 points as the Thunder (11-6) took full advantage of a hamstrung Warriors team (12-7) missing the injured pairing of Stephen Curry and Draymond Green on Wednesday. And, after the Warriors' 28-point loss - their worst run and second-biggest defeat at home under Kerr - the coach grimly admitted to reporters that they were in free fall until Curry, who is not expected to be back until at least early next week, returns. "We've got better days ahead," Kerr told the San Francisco Chronicle. "But right now, we're just in a tough go." Kevin Durant had a 27-point, 14-rebound double-double, and Klay Thompson also scored 27 for the Warriors. But their two-man show was not enough to offset the team's wayward shooting from beyond the arc, making just seven of 29 attempts. Damion Lee was the only other Warrior to score in double figures with 13 points, and Durant revealed to www.sfgate.com that some of their issues stemmed from a change in the group dynamics. "It's just a different team from last year," the nine-time All-Star said. Thompson concurred with his teammate, but still felt there was "a positive to be taken out", saying: "It wasn't pretty tonight, and it hasn't been these last four games. But it's the first time we've ever lost four games under Steve. That's pretty amazing when you think about it." Unlike the Warriors, the Thunder had a lot more to smile about after their 11th win in 13 games and the return of Westbrook following a six-game absence, with the only downside being the injuries to guards Terrance Ferguson and Hamidou Diallo. Ferguson hobbled off with a left ankle sprain while Diallo was stretchered off after landing awkwardly on his left leg, but Westbrook claimed fighting through adversity was the team's hallmark. The Warriors lost four straight for the first time under coach Steve Kerr. "Just having each other's back. When guys go down, we're a family here and we have to have our brother's back, and that's what we're going to do," the seven-time All-Star said.